In Mexico, the tobacco fields are disappearing and workers like Otoniel Rivera are struggling to find a way to support their families. Despite this decline, the tobacco industry is still playing the farm card in its attempts to thwart regulation from the Mexican Congress. Harvested tobacco is strung along collars by workers and then hanged to dry before further processing. The tobacco industry finances social responsibility projects for tobacco families in Mexico, such as this day care for children of tobacco workers. No longer profitable, tobacco fields in Mexico now account for only 2 percent of farmed land in the country. Smoking percentage of each population. In October, in chaotic Mexico City, a small army of protestors, sporting placards and shouting into bullhorns, worsened the usual traffic snarl around San Lazaro, the nation’s congressional office complex. Television news accounts showed screaming-mad tobacco farmers, some of whom had boarded buses and traveled 500 miles to warn federal legislators that new taxes on cigarettes would put them out of business. Inside, lawmakers were in a tug-of-war over a landmark excise tax law that eventually added about 50 cents to a pack of cigarettes and — anti-tobacco activists hoped — would make tobacco less attractive to consumers. 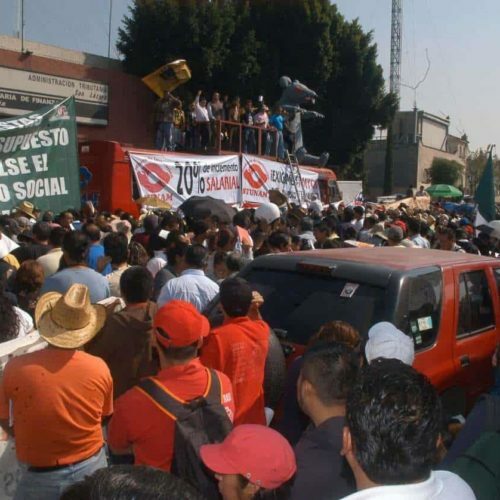 It was not the first time these farmers had traveled far to protest in Mexico. Like tobacco growers around the world, Mexican campesinos — farmers and farmworkers — for years have been deployed to send a message to the public and politicians: Jobs are at stake in the effort by public health advocates to eliminate tobacco ads and limit smoking. As the global fight over smokers moves from the United States and other countries where tobacco consumption is on the decline, Big Tobacco has drawn a line around developing nations that account for an increasingly important share of their revenues. And, from Jakarta in Indonesia to Mexico City, farmers have been reliable street-level lobbyists in the industry’s fight against smoking limits. Farmers say they’re defending their jobs, even though experts insist that the buying habits of multinational companies have more impact on the fortunes of growers than anti-tobacco rules designed by the World Health Organization and public health officials who seek to shrink the human and fiscal costs of tobacco-related disease. Between 2005 and 2030, 135.1 million people will have died worldwide in developing nations because of smoking-related illness, according to the World Lung Foundation. Tobacco consumption is the globe’s leading preventable cause of death. In Mexico “the anti-tobacco campaigns didn’t hit farmers as hard as the companies’ global strategies have,” said Javier Castellón, a senator representing western Mexico’s Nayarit state, a swath of humid terrain once known as the Gold Coast because of the value of its tobacco crops. In Mexico City protests in recent years, farmers have been vocal and proud to stand up for their business, even if some who attended the marches said they’d received stipends for doing so. In interviews with the International Consortium of Investigative Journalists, farmers in Nayarit state recalled getting about $20 a day and restaurant and hotel stipends for trips to the nation’s capital. “Many of the ‘farmers’ there were not ,” said one grower, who asked that his name not be used because he fears economic reprisal from tobacco companies. One of the industry’s strongest political avatars in developing nations has been the International Tobacco Growers Association (ITGA). It works in Mexico through local farmers associations. And around the world, ITGA activities mirror those of grower groups here. In November, tobacco growers protested in Punta del Este, Uruguay, outside a meeting of WHO officials and tobacco-control delegates from around the globe who had gathered to discuss the progress of smoking restrictions and excise tax initiatives. The growers were there to rally against a proposal to ban burley tobacco, used to make flavored cigarettes. ITGA organized the Uruguay protest. The group says that in 22 countries it represents 85 percent of the world’s tobacco producers. On its website ITGA says it promotes empowerment, understanding and advocacy for tobacco growers and tobacco growing nations around the globe. But the website doesn’t say that ITGA is a Big Tobacco brainchild. ITGA was formed and funded through a historically tobacco industry-driven research entity, INFOTAB — the International Tobacco Information Center, according to internal tobacco corporate documents made available after lawsuits against the industry in the U.S.
Former ITGA President Roger Quarles doesn’t deny the group is partially funded by the industry. Tobacco is grown in more than 100 countries. Mexico has declined into a mid-level player, but its leaf still spices the mix in cigarettes manufactured here and abroad. There’s still abundant consumer demand for tobacco in Mexico: About 16 percent of Mexican adults still smoke, and a growing number of teenagers have tried cigarettes at least once. Because of that, the Mexican public health ministry estimates the country spends $5.7 billion a year providing medical care for tobacco-related illnesses. An estimated 60,000 tobacco-related deaths are reported each year in Mexico. Mexico is also home to the world’s richest man, Carlos Slim Helú, who is Latin America’s biggest tobacco baron, with a seat on the Philip Morris International board of directors and a stake in the company’s Mexican brands. Philip Morris and British American Tobacco dominate the cigarette market in Mexico. They´ve been involved in farm production since the late 1990s after the government privatized national tobacco production. BAT eventually purchased Cigarrera La Moderna and Philip Morris increased its shares in Slim´s Cigatam. Other foreign companies now produce tobacco for cigarettes sold abroad. But in Amapa, in Nayarit state — this was once the center of the Mexican tobacco-farming business — BAT has moved out of its large building and into a smaller office on the outskirts of town. The U.S.-based tobacco leaf vendor Alliance One closed its offices two years ago and liquidated its local assets. A supermarket is being built on land where another company´s reception center was once located. Out in the fields, hundreds of drying furnaces sit unused and farmers say they now miss the sweet smell, like chocolate, that once hung over the region at dawn. In the past, summer signaled abundant farm activity in Amapa. Tobacco farmers bought cars, tractors and furniture, and paid off debts at stores that they had frequented in the months before the harvest. But tobacco is no longer king. The average area contracted for tobacco production in Nayarit state went down from 60,000 acres in the 1990s, to 20,500 in the past decade, according to Mackinlay’s data. Less than 3,000 farm owners in Nayarit are contracted every year, versus 15,000 back in the mid ’90s, and 6,000 in the year 2000. Currently, tobacco grows on only 2 percent of the state’s available farm land. Amid this decline, transnational companies and their Mexican partners also introduced major changes to Mexican tobacco production, forcing higher quality standards on farmers. Although this has increased yields in some regions, it also has increased production costs for farmers. BAT spokesman Carlos Humberto Suárez said tobacco production is down in Nayarit because of a roughly 4 percent decrease in legal cigarette consumption and a series of years with drought and floods that affected the area. Despite this, he said, BAT has increased the contracted area in other parts of Mexico and exports the tobacco to Trinidad and Tobago, Honduras and Pakistan. The decline of Nayarit’s tobacco farms prompts a critical question: With the diminished importance of Mexico’s tobacco growers, why does the industry still rely on them to bolster political arguments? “Surely they need certain types of tobacco produced in Mexico, and they import mostly those types that can be found at lower prices in the international market” Mackinlay said. But also, “they need a base for lobbying. They need a certain minimum level as a pretext to plead that producers would be affected” by restrictions and taxes. This is because, in Mexico, politicians strive to avoid being linked to public policies that affect the poor. The tobacco companies’ largest operations today are mostly automated factories and employ fewer people. They’re located in the capital and in the northern city of Monterrey. That kind of a tobacco operation is unlikely to generate the kind of sympathy a farmer can. There is in Mexico a history of tobacco lobbyists successfully using farmers as counterweights during debates over cigarette taxes. The danger of losing jobs is a perennial argument against anti-tobacco legislation and tax increases. For decades it was an effective tool for lobbyists and lawmakers from tobacco regions. The result: It was not until 2008 when the first tough anti-tobacco law was approved in Mexico. And only in 2010 did the nation’s most important excise tax finally take effect. In a written statement, BAT spokesman Suárez told ICIJ that farmers’ protests are totally independent from the company. Yet a recent examination of lobbying strategies of cigarette makers in Mexico, by the Center for Research and Teaching in Economics, CIDE, found that the industry’s philanthropic and public relations efforts are most vigorous in the states where cigarettes are produced or processed. BAT, for instance, has heavily promoted its corporate social responsibility projects: In Mexico City’s international airport, the company hung large billboards to advertise Florece, a daycare program it originally operated with Philip Morris. The campaign extends care to hundreds of indigenous children who could otherwise end up working in tobacco fields with their parents. A young campesino boy appeared in the billboard photo, enjoying a picnic under the shade of a tree. One such daycare center operates in Amapa, where people hold it in high regard. “These measures seek to capitalize on the tobacco industry´s image in order to be well positioned to legislators and the government when any initiative to modify tobacco regulation is presented,” the CIDE study says. The companies work to be seen as good corporate citizens, the study adds, especially before state governors who wield great local influence. The companies also have tried to work closely with 54 federal legislators who represent tobacco-growing and cigarette-manufacturing regions. Despite diminishing production, cigarette manufacturers still count on farmers, analysts said, because they are popular cultural figures for Mexicans. Tobacco money has also built political careers and fortunes in Nayarit. It was, for decades, almost a given that the leader of the tobacco union became a mayor. One tobacco man, Rigoberto Ochoa, even became Nayarit’s governor in 1993. At that time tobacco still generated approximately 25 percent of the state’s gross domestic product, Mackinlay said. Another factor weighs heavily in the minds of growers, especially older ones, and in favor of the big tobacco companies: Among Mexico’s many farmers, only tobacco and sugar cane growers are entitled to government health insurance and retirement stipends. Tobacco-growing families also get full, government-paid medical benefits, unlike growers of other crops. “Those who still plant tobacco are there only to keep their health insurance,” said Federico Langarica, a former tobacco-grower organization leader. His brother used to be one of the largest producers in Nayarit. Many Nayarit politicians once worked in the fields themselves or came up through the ranks of the area’s tobacco cooperatives. The current tobacco growers´ group leader is a local legislator who is running to become mayor of another Nayarit city. But as politics in Mexico has shifted away from one-party rule, there’s also been a geographical shift for tobacco farmers in Nayarit. As the sun came up on a spring day in 2011, three men started work on a farm in Amapa, getting work done before the sun made outdoor work intolerable. Laborers, including children from a local indigenous tribe, the Huichol, were already at work in a neighboring camp. They toiled under an improvised tent that during the tobacco season doubles as their home, with no running water, no flush toilets and a long walk from the nearest store. Otoniel Rivera and Juan Plascencia were sewing together tobacco leaves with a large metal needle, fitting them in long collars that their boss Cesáreo Zamarripa hangs out to dry on tall stakes. Plascencia used to be a farmer, until he realized he could earn more money as a worker. “You put in more money [as a farmer] than you get,” Plascencia said. Zamarripa nodded behind him. A greater irony is that today, more former Mexican farmers are realizing the globalized tobacco industry still needs them — just not in Mexico. Outside of a home in town, a little girl stood peering through an open window. The girl was talking with José Alberto Perez, 31, who was preparing for a big trip. She was intrigued by the saline drip bag tethered to Perez’s body; he was getting ready for a long summer and fall in the United States, in North Carolina and Kentucky. His bet was that the vitamin-enriched serum he was absorbing would help him resist effects of chemicals he heard are applied to U.S. tobacco fields. In another house, Edelberto Serrano organized hundreds of passports into tidy stacks in plastic boxes on his bed. He stood tall in black boots and a cowboy hat. Serrano is a labor contractor for the U.S. Tobacco Growers’ Association of North Carolina. He was about to embark on a series of cross-border work trips with 2,500 Mexican farm workers wielding guest-worker visas – most of them assigned to work on tobacco fields in the United States. Outside his makeshift office, a group of men await word from Serrano on their applications for work in the United States. As they wait, they talk of another bad growing season for Mexico’s own tobacco crop, and their desire to travel north. Even Rivera — once he’s done helping Zamarripa with his fields — will jump on a bus headed for the U.S. His tours north of the border usually take him to North Carolina. There, he said, he’ll stay from four to seven months, working up to 14 hours a day and at night sharing a crowded house with other workers. Sometimes with rats, he added. Yet the transnational farm work sustains his family for the rest of the year, and has paid for the home he´s built in Amapa. Meanwhile, Rivera awaits a call from Serrano, the labor contractor. He has already invested $400 and still owes $700 more for the fees and paperwork that will assure his next trip to the U.S.
To find their economic advantage in the global marketplace, Mexico’s tobacco men now rely on the industry’s demand for their services in two countries. In Mexico, when called upon, they’ll rally on behalf of low cigarette taxes and the rights of smokers. In the United States, they help bring in multinational crops from the farms of others. The companies “always end up winning lots of money, and the farmers, they stay always the same,” Federico Langarica said. Alexandra Xanic von Bertrab is a Mexico City-based freelance investigative journalist and a member of ICIJ’s Smoke Screen team. ICIJ staff writer Traver Riggins contributed to this report.